For other uses, see Puma. Puma is a genus in the family Felidae that contains the cougar (also known as the puma, among other names), and may also include several poorly known Old World fossil representatives (for example, Puma pardoides, or Owen's panther, a large, cougar-like cat of Eurasia's Pliocene). In addition to these potential Old World fossils, a few New World fossil representatives are possible, such as Puma pumoides and the two proposed species of the so-called "American cheetah". Pumas are large, secretive cats. They are also commonly known as cougars and mountain lions, and are able to reach larger sizes than some other "big" cat individuals. Despite their large size, they are thought to be more closely related to smaller feline species. The seven subspecies of pumas all have similar characteristics, but tend to vary in color and size. Pumas are thought to be one of the most adaptable of felines on the American continents, because they are found in a variety of different habitats, unlike other various cat species. Members of the genus Puma are primarily found in the mountains of North and South America, where a majority of individuals can be found in rocky crags and pastures lower than the slopes grazing herbivores inhabit. Though they choose to inhabit those areas, they are highly adaptive and can be found in a large variety of habitats, including forests, tropical jungle, grasslands, and even arid desert regions. Unfortunately, with the expansion of human settlements and land clearance, the cats are being pushed into smaller, more hostile areas. However, their high adaptability will likely allow them to avoid disappearing from the wild forever. Subspecies of the genus Puma include cats that are the fourth-largest in the cat family. Adult males can reach around 7.9 feet from nose to tip of tail, and a body weight typically between 115 and 220 lb. Females can reach around 6.7 ft from nose to tail, and a body weight between 64 and 141 lb. They also have tails ranging from 25 to 37 in long. The heads of these cats are round, with erect ears. They have powerful forequarters, necks, and jaws which help grasp and hold prey. They have four retractable claws on their fore paws, and also their hind paws. The majority of pumas are found in more mountainous regions, so they have a thick fur coat to help retain body heat during freezing winters. Depending on subspecies and the location of their habitat, the puma's fur varies in color from brown-yellow to grey-red. Individuals that live in colder climates have coats that are more grey than individuals living in warmer climates with a more red color to their coat. Pumas are incredibly powerful predators with muscular hind legs, which are slightly longer and stronger than the front, that enable them to be great leapers. They are able to leap as high as 18 ft into the air and as far as 40–45 ft horizontally. They can reach speeds up to 50 mph, but they are much better adapted for short and powerful sprints to catch their prey. Members of the genus live solitarily, with the exception of the time cubs spend with their mothers. Individuals cover a large home range searching for food, covering a distance around 80 mi2 during the summers and 40 mi2 during the winters. They are also able to hunt at night just as effectively as they can during the day. Members of the genus are also known to make a variety of different sounds, particularly used when warning another individual away from their territory or during the mating season when looking for a mate. A study released in 2017 suggests that pumas have a secret social life only recently captured on film. They were seen sharing their food kills with other nearby pumas. They share many social patterns with more gregarious species such as chimpanzees. Members of this genus are large and powerful carnivores. The majority of their diet includes small animals such as mice, rats, birds, fish, and rabbits. Larger individuals are able to catch larger prey such as bighorn sheep, deer, guanaco, mountain goats, raccoons, and coati. They occasionally take livestock in areas with high populations of them. Breeding season normally occurs between December and March, with a three-month gestation period resulting in a litter size up to six kittens. After mating, male and female part ways; the male continues on to mate with other females for the duration of the mating season, while the female cares for the kittens on her own. Like most other felines, kittens are born blind and remain completely helpless for about 2 weeks until their eyes open. Kittens are born with spots and eventually lose all of them as they reach adulthood. The spots allow the kittens to hide better from predators. Kittens are able to eat solid food when they reach 2–3 months of age, and remain with their mother for about a year. The life expectancy of individuals in the wild averages 12 years, but can reach up to 25 years in captivity. Although they have been pushed into smaller habitats by human settlement expansion, members of the genus have been designated least-concern species by the IUCN, indicating low risk of becoming extinct in their natural environments in the near future. This is due to their high adaptiveness to changing habitat conditions. In fact, many feel the pumas' ability to adapt to different environments explains their current numbers. 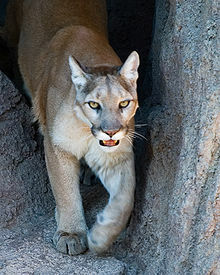 However, in many large metropolitan areas such as Los Angeles, California, pumas' habitats have been fragmented by urban development and massive freeways. These barriers have made it nearly impossible for populations of mountain lions in specific areas of mountain ranges to reach one another to breed and increase genetic diversity. While their numbers still remain at decent[vague] levels, the number of kittens that are inbred is rising every year. This poses a threat to these already-reduced communities of mountain lions that are forced to quickly adapt to shrinking habitats and increased run-ins with humans. Many researchers from the National Park Service are using their findings to propose ideas to cities like Los Angeles, which harbors large populations of urban wildlife, to increase conservation efforts in areas on both sides of freeways, and begin the process of building land bridges for wildlife to safely cross freeways. ^ Wozencraft, W.C. (2005). "Order Carnivora". In Wilson, D.E. ; Reeder, D.M (eds.). Mammal Species of the World: A Taxonomic and Geographic Reference (3rd ed.). Johns Hopkins University Press. pp. 544–545. ISBN 978-0-8018-8221-0. OCLC 62265494. ^ Hemmer, H. (1965). Studien an "Panthera" schaubi Viret aus dem Villafranchien von Saint-Vallier (Drôme). Neues Jahrbuch für Geologie und Paläontologie, Abhandlungen 122, 324–336. ^ Hemmer, H., Kahlike, R.-D. & Vekua, A. K. (2004). The Old World puma Puma pardoides (Owen, 1846) (Carnivora: Felidae) in the Lower Villafranchian (Upper Pliocene) of Kvabebi (East Georgia, Transcaucasia) and its evolutionary and biogeographical significance. Neues Jahrbuch für Geologie und Paläontologie, Abhandlungen 233, 197–233. ^ Chimento, Nicolas Roberto, Maria Rosa Derguy, and Helmut Hemmer. "Puma (Herpailurus) pumoides (Castellanos, 1958)(Mammalia, Felidae) del Plioceno de Argentina." 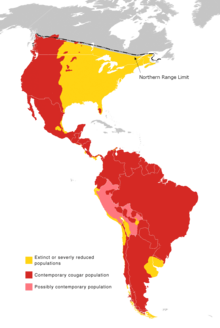 Serie Correlación Geológica 30.2 (2015). ^ Barnett, Ross, et al. "Evolution of the extinct Sabretooths and the American cheetah-like cat." Current Biology 15.15 (2005): R589-R590. ^ a b c d e f g "Puma (Felis concolor)". Retrieved 16 December 2015. ^ Palmieri, Tim (2017-10-12). "The Secret Social Live of a Solitary Puma". Scientific American. Retrieved 2017-10-12. ^ Ernest, Holly B.; Wayne, Robert K.; Dalbeck, Lisa; Sikich, Jeffrey A.; Pollinger, John P.; Serieys, Laurel E. K.; Riley, Seth P. D. (2014-09-08). "Individual Behaviors Dominate the Dynamics of an Urban Mountain Lion Population Isolated by Roads". Current Biology. 24 (17): 1989–1994. doi:10.1016/j.cub.2014.07.029. ISSN 0960-9822. PMID 25131676. This page was last edited on 21 March 2019, at 21:48 (UTC).